You are probably already fully aware of the new Common Core State Standards for English Language Arts and Mathematics. However, just in case you need a little clarification, the Common Core State Standards are a rigorous set of state-driven educational standards for English Language Arts and Mathematics that were designed to bring consistency to student expectations in kindergarten through 12th grade. These standards are intended to better equip teachers and parents so they can help students master the skills necessary to be successful in college and careers. 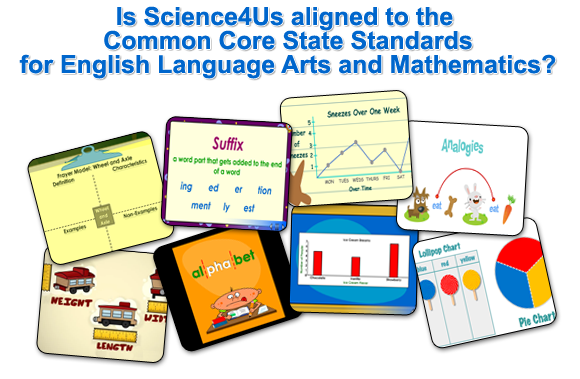 So, what do the Common Core State Standards for English Language Arts and Mathematics have to do with Science? If Sir Isaac Newton hadn’t been able to describe and explain what he had learned about gravity, would his knowledge have been lost? Without Benjamin Franklin’s calculations, how much longer would we have been in the dark without electric light bulbs? Science doesn’t exist without measurement (math) or communication (language). In addition to being a complete science curriculum, Science4Us has also been carefully crafted to include language arts and math skills. The Science4Us curriculum provides a multitude of opportunities to address and reinforce language arts and math skills while teaching science content. For example, each module has a selection of activities that offer students practice in language skills like letter recognition, decoding, and word-building. In addition, each module provides exposure to different types of literature such as songs, poems, and narrative stories – all with a science focus. From syllables to similes, language skills can be fun to learn when you reinforce the concepts through science vocabulary. Math skills are also an important part of the Science4Us curriculum. Students using Science4Us will have the opportunity to work with different types of charts and graphs, reading and interpreting data. Bar graphs, line graphs, tally charts, pie graphs and many more are introduced and students even have an opportunity to apply their new knowledge by constructing their own. With time being such a precious commodity in the early elementary school classroom, it only makes sense to capitalize on cross-curricular opportunities whenever possible. Science can be a wonderful vehicle for reinforcing math and language arts concepts in a way that keeps students engaged and coming back for more.